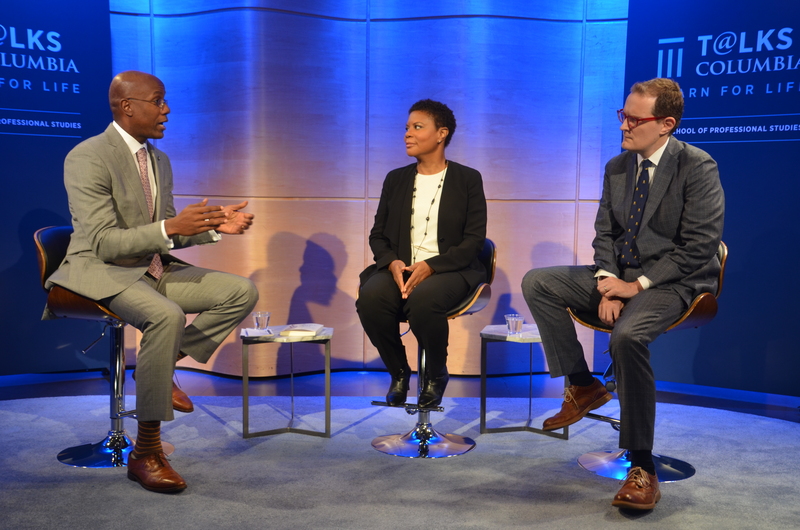 The latest edition of Talks@Columbia, “Understanding the Genome in the Information Age,” featured Columbia University Professor of Sociology and President of the Social Science Research Council Dr. Alondra Nelson and Forbes Senior Editor Matthew Herper. The panel was moderated by Dean Jason Wingard. Dr. Nelson is an award-winning social scientist and author, whose research and writing explores the intersection of science, medicine, and social inequality. Her recent New York Times opinion piece “Elizabeth Warren and the Folly of Genetic Ancestry Tests” establishes the differences between technical, genetic data and the social nature of identity. Mr. Herper has been writing for Forbes for close to twenty years. As Senior Editor for Pharma and Healthcare at Forbes, he consistently covers the biotechnology and pharmaceutical industry and is one of the most prominent journalists in this space. He has written thousands of articles on topics including the Human Genome Project and innovations in DNA technology. The discussion covered topics including: the current state of DNA testing, the differences between medical and genetic ancestry, privacy issues and risks, the need for genetic counseling and corporate social responsibility in the field, and finally, what guardrails our society needs to put in place as the technology advances. Watch the full conversation at Talks@Columbia.